Mass Effect fans rejoice, while you may have months until Mass Effect 3 is released, you now have a little something to tide you over in the mean time. Mass Effect: Invasion has been highly anticipated and the wait is finally over. The comic has a decisive Mass Effect feel to it, nothing has been lost in the translation. The art is very good, as is the dialog, however, the dialog at time times can be just a little confusing, mainly because there is just so much going on. This is an excellent introduction into a limited series. The entire comic from start to finish is a fun, fast paced adventure full of anticipation. There are some slow points but for the most part it is non-stop action. Invasion follows Aria T’loak, who is very much a dictator type, and her mission to defend Omega from an invasion of nasties who are threatening all her and her people have fought for. We learn of Reaper technology and what that exactly entails. We see those who will be working against her and those she has to make allies. Aria’s people believe in her but often times it seems that they do so more out of fear than loyalty. Either way they have her back and refuse to go down without a fight. In the end we see a character who is planning a coup against Aria and her mission. 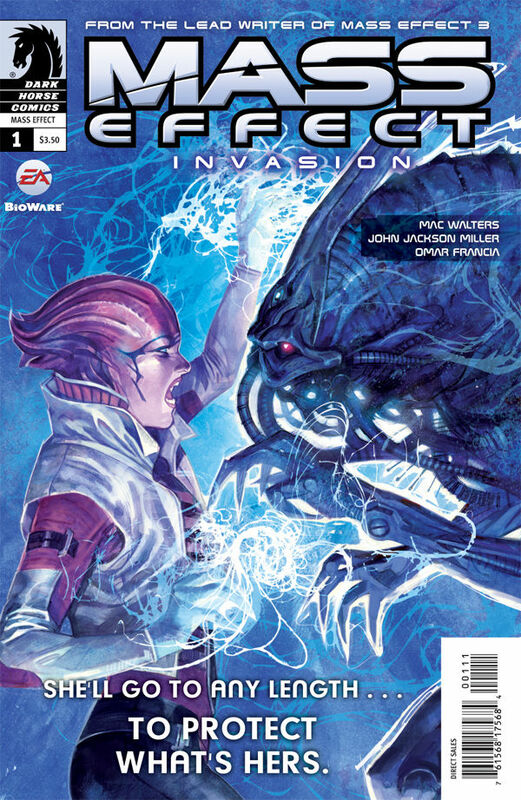 Mass Effect: Invasion ends in such a way that leaves the reader wanting more. This comic is recommended whether you are a Mass Effect groupie or someone who has never heard of it before today and just likes sci-fi. It’s a strong, good, enjoyable read! 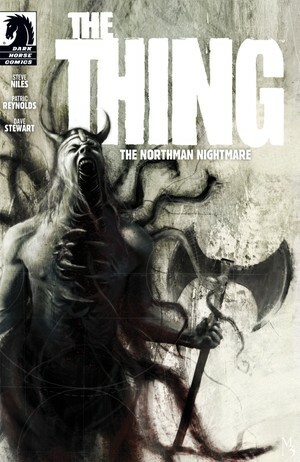 This comic is to coincide with the October 2011 theatrical release of The Thing. The story begins in 1121 A.D. with a group of vikings on a mission. They must walk on foot through the snow and treacherous conditions to find a group of their people. As they continue on their journey they find that all may not be right around them. Bodies and “mutated” skulls litter the terrain, accidents occur and the people they are looking for seem to have gone missing. One thing to be said about these vikings, they do not play. A particular event occurs, a decision needs to be made and without hesitation a quite horrendous action takes place with no hard feelings. These guys are tough, pure and simple! When they reach their destination the weirdness really begins to occur. A group of women are all that is left in the tiny village and they are more than they appear to be. The vikings continue to fight, but the question becomes will they be victorious? The story, art and dialog are all very good. Steve Niles is quickly becoming one of my favorites. He really creates cool characters and is quickly able to set up personalities and backstory within those characters. Overall, I would recommend this, however, more action would have made The Thing a better read. If you are a huge fan of The Thing, what are you waiting for? Go get it! There is probably something for everyone in this issue of Darkhorse Presents, however, all the stories were not my cup of tea. For the most part the art in all the comics is always good, but some of it is really great and at other times it is just kind of there. I think the order that the stories are put in is very good, you often have an action packed comic followed by a more mundane one which is then followed by a more exciting comic again. In this review I will highlight a couple of the comics that really stood out. The first story in this anthology is Eric Powell’s Isolation. This is a wonderful opener into the book. After reading it I wanted to keep reading in hopes that the stories that would follow would be just as amazing. This is one of the best comics I have read in a really long time. The art is typical Eric Powell style and it is fabulous. 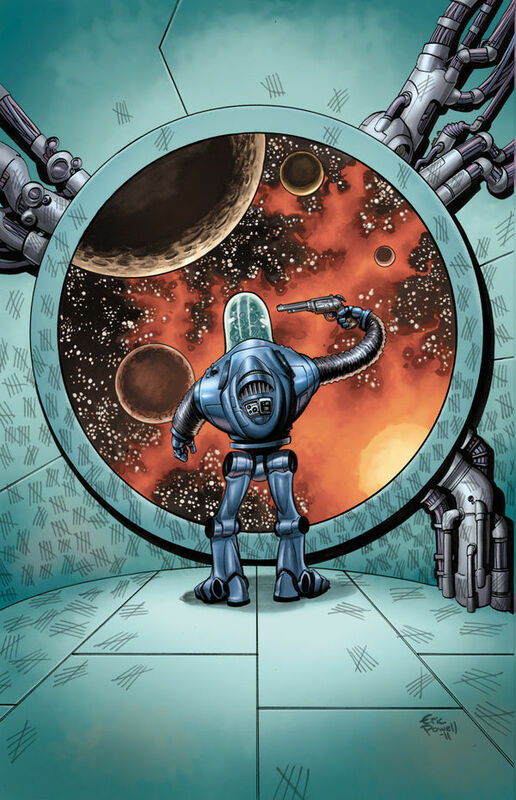 The story is about Jerry the robot, who is sent on a very long mission to scout out a new planet for humans, as Earth is reaching it’s demise. Jerry is dubbed as the hope for humanity. He was built with human like thinking and emotion, both good and bad. As he sets off on his journey he receives presents from people, three in total, all really surmising humanity in general. Useless gifts on this particular type of journey, however one could really imagine these types of gifts being giving in a situation like this. Jerry, decades on the ship, goes through many changes, anger, apathy, despair and finally selfishness. Jerry’s journey within a journey is amazing and in the end you really feel for the decision he ultimately makes. This was a truly great read and highly recommended. The other standout in the book is Steve Niles’ Criminal Macabre: Die Die My Darling Part 2. I am a sucker for this type of artwork, Christopher Mitten is a fabulous artist and really makes the comic pop and come alive with his work. I am new to Criminal Macabre but everything I have read thus far have been amazing. This story finds Cal with his life in danger (surprise, surprise) and very little time to rectify the situation. Cal does what he needs to do, with an easiness and blasé attitude that really helps to make him such a cool character. He really never worries about much except when he can start drinking again. Overall, I would recommend this compilation. I think everyone will be able to find at least a few comics that they will like. If you’re lucky maybe you will find something completely new and find a whole new series to read!